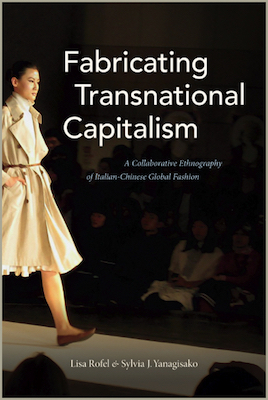 Professor Emerita Lisa Rofel announces the publication of her latest book, Fabricating Transnational Capitalism: A Collaborative Ethnography of Italian-Chinese Global Fashion, through Duke University Press. Professor Emerita Lisa Rofel has announced the publication of her latest book, Fabricating Transnational Capitalism: A Collaborative Ethnography of Italian-Chinese Global Fashion. According to the publisher, Duke University Press, this is an innovative collaborative ethnography in which Lisa Rofel and Sylvia J. Yanagisako offer a new methodology for studying transnational capitalism. The book focuses on how Italian fashion is manufactured, distributed, and marketed by Italian-Chinese ventures and how their relationships have been complicated by China's emergence as a market for luxury goods. "The authors illuminate the often-overlooked processes that produce transnational capitalism—including privatization, negotiation of labor value, rearrangement of accumulation, reconfiguration of kinship, and outsourcing of inequality," says Duke University Press. For more information, and to order the paperback at a 30% discount, please visit Duke University Press and enter coupon code E18FABR during checkout.